Episode 147 features Mona Maali, who hails from Austin Texas. Mona was the chapter leader of the Austin National Stuttering Association (NSA) chapter for four years, and was named the NSA Adult Chapter Leader of the Year in 2010. Presently, Mona is a bookseller at an independent book store in Austin. 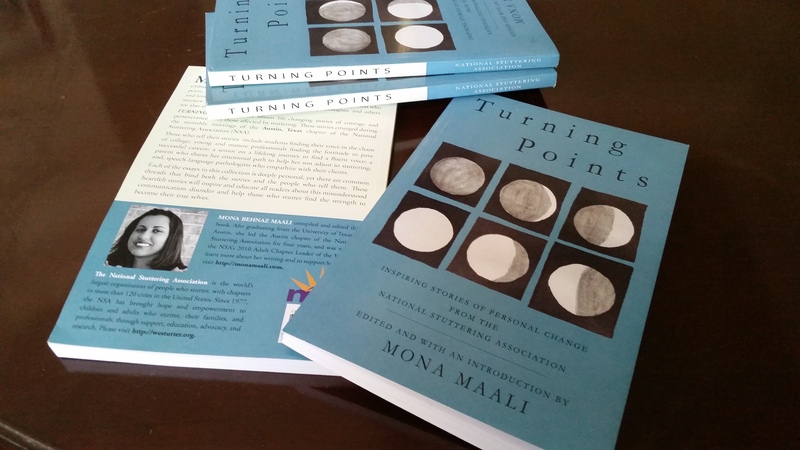 Mona also compiled, edited and published a book called Turning Points, which features the stories of many people from the Austin NSA chapter. Listen in as we discuss parts of Mona’s story, where she honestly and courageously shares her journey both with stuttering and ADHD. She has lived with ADHD as long as she has with stuttering and both have had a profound impact on her life. We discuss whether Mona thinks there is a connection between stuttering and ADHD. Mona shares that both disorders are highly stigmatized and often the individual is “blamed for” having the disorder. Mona didn’t receive help for either stuttering or ADHD while growing up. The second half of our conversation focuses on how the book, Turning Points, came to be. It was a two year process of gathering other people’s stories and at the same time overcoming and delving deeply into Mona’s own personal journey. Mona shares quite eloquently why she didn’t include her own story, and how she feels very hopeful to have published a book. She is very pleased with how it turned out. You can purchase the book at Amazon or at the NSA online store. Today’s music is credited to ccMixter. I was interviewed by a friend last Wednesday for an article she wrote about how people who stutter use the internet to form communities. The article is called “The way we talk when we talk about stuttering” and it was published this Sunday January 18 in my friend’s home town of Austin, Texas. Talking to my friend was a great opportunity for me to reflect on all the different ways I use the internet to form communities. I have the community that follows this blog, which is still going strong after almost 6 years. 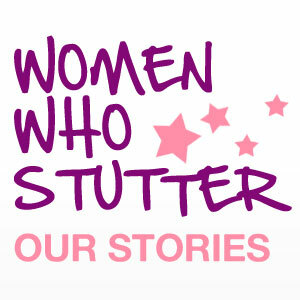 I have the community of women from all over the world that have been part of my podcast “Women Who Stutter: Our Stories” for almost 5 years. And I have the community that has formed from being a Stutter Social host every other week. Episode 128 features Farah Al Qaissieh who hails from Abu Dhabi, United Arab Emerites. Farah works in the strategy department of a government office. She is also the co-founder of a stuttering support group, called “Stutter With A Smile“, which began in July 2013. Farah and a friend started the group through Meet-Up.com and advertised through social media and word of mouth. Their first meeting attracted 15 people, and has since averaged 10 people of all ages, including speech language pathologists. Listen in as we discuss why she wanted to start a support group, the impact it has had on her and members and the group’s goals. We also discuss Farah’s own personal journey with stuttering and what it has meant to her. This was a great conversation, where we hear a voice from another part of the world. Listen and feel free to leave comments. Feedback is a gift. This is the documentary that appeared in the UK about two weeks ago, featuring several people who participate in the 4 day McGuire program, an intensive stuttering management program. All of the participants bare their emotions for us during the documentary, so we get a real glimpse as to how complex stuttering really is. Thank you to Maria McGrath for sending me the YouTube link, so those of us outside the UK could watch the film, which is great. Episode 122 features Yousra Ouchen, a 25 year old who hails from Casablanca, Morocco. Yousra works as a financial consultant in an accounting company. She enjoys playing the guitar, drawing and writing. Yousra is a founder of the new Moroccan Association of Stammering, which is on its way to becoming official. The association currently has 15 members. Listen in as Yousra discusses what it’s been like getting the association off the ground and the work it involves. We also discuss the perception of stuttering in Morocco, and how people who stutter are seen as not having confidence. Yousra also shares her speech therapy experiences, and how talking about stuttering helps her to feel better about it. This was a great conversation with a strong young woman who is determined to help people who stutter in her country. Feel free to leave comments or questions for Yousra. The podcast safe music used in this episode is credited to ccMixter.